KINSHASA, 25 Sep 2006 (IRIN) - Senior aides to the two candidates running for president in the Democratic Republic of Congo (DRC) have agreed to make Kinshasa a weapons-free zone to ensure that the fighting that followed the first-round results in August is not repeated. 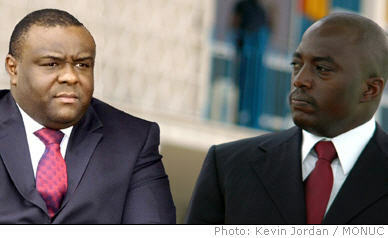 "This agreement seeks to reduce the risk of fighting in the city of Kinshasa so that the second round of elections can take place peacefully," according to the agreement signed on Friday by Samba Kauto, a senior security adviser to the incumbent president, Joseph Kabila, and François Muamba, representing presidential challenger Jean-Pierre Bemba. The document states that the measures are designed to reassure the local population that it is safe to vote in the run-off election scheduled for 29 October. After signing the agreement Muamba said: "The measures should be kept in place until results of the second round have been made public and even until the new elected government is installed." International as well as government officials have expressed concern about the number of weapons circulating in Kinshasa. "This agreement focuses on Kinshasa because this is where there is a problem of the proliferation of arms," Jean-Tobbie Okala, spokesman for the United Nations Mission in the DRC (MONUC), said. Officials who did not want to be quoted said most of the guns were in the hands of militia groups loyal to either Bemba or Kabila. Friday's agreement was reached almost exactly a month after fighting between Kabila and Bemba's forces killed at least 23 people in Kinshasa. Kabila and Bemba have now agreed to keep their troops in the barracks during the second round and to respect the weapons ban. The agreement says that to enforce the ban there would be "control, surveillance and verification mechanisms". However, it does not state who will enforce the ban although it does say that assistance will be sought from MONUC and the European Union force in the DRC, known as EUFOR. Okala said the police will be the only national security force authorised to carry weapons. However, it may be difficult to enforce the ban, particularly as the agreement does not allow for civilians to be searched. Observers have said armed groups might decide to don civilian clothes.